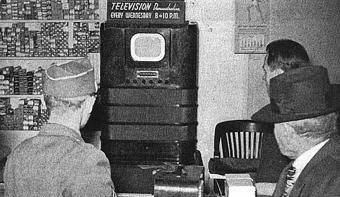 In 1946 a 10-inch, black-and-white RCA television set cost $400. Today, that’s about $4500, enough to buy a few very large flat screen TVs and Blu-Ray players. Most post-World War II Americans wanted to own a TV, but few could afford it. Besides, there weren’t many TV shows to watch in 1946. In those early days, networks found that sports were a cheap way to fill up air time. All they had to do was train a camera on a baseball game, boxing match, or roller derby bout, and people would watch. And bar owners realized that a TV over the bar would pay for itself (and then some) when patrons showed up to watch sports and buy beer. Neighborhood taverns all over the country posted signs promising, “We have TV!” In 1946 and 1947, half of all televisions sold in the United States were to bars. The first major sporting event to air on TV took place on June 19, 1946: a heavyweight title bout between Joe Louis and Billy Conn (Louis knocked out Conn in the eighth round.) The boxing match set a TV viewing record: 140,000 people watched, most of them in bars. A year later, that record was shattered when a million people watched the Joe Louis/”Jersey Joe” Walcott title fight. When the 1947 World Series aired on TV, bars around the nation reported lines winding around the block. 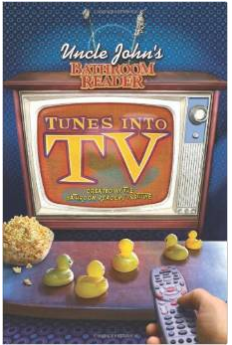 Television had found its first mass audience. With so many people buying drinks while they watched TV, advertising beer on TV was a natural fit- viewers could order the product while the ad was still on. Unlike today’s system of selling blocks of ad time, back then, individual companies would sponsor an entire program and get all the advertising spots. Regionally dominant beers quickly snapped up sponsorship rights for locally televised sports. Narragansett Beer was the first sponsor of televised Boston Red Sox games, Goebel Beer sponsored Detroit Tigers baseball. Griesedieck Brothers Beer backed several sports shows in St. Louis, Iron City Brewing sponsored the Pittsburgh Pirates, and Ballantine Beer sponsored New York Yankees games. Into the 1950s, beer commercials continued to appear during sporting events, but as television sales grew, the ads popped up all over the airwaves. In 1951 Blatz Beer paid a whopping $250,000 to sponsor the TV debut of the hit radio show Amos ‘N Andy. Pabst Blue Ribbon backed the sitcom The Life of Riley. And then there was The Ken Murray Budweiser Show, a talk show in which Murray and his guests drank a few cold ones while they chatted. Revenue from all those beer ads helped keep the fledgling television industry in business. But it was another popular product that really launched prime-time programming: tobacco. As beer and sports seemingly went together (then and now), in the 1940s and ’50s, cigarettes and sophistication went together. At that time, there were few scientific reports linking tobacco with health problems, and cigarettes enjoyed a fairly positive public image. A burning cigarette looked glamorous in black-and-white movies, and millions of men had gotten hooked on smoking thanks to the cigarettes in their soldier ration kits in World War II. Cigarette-company sponsored shows, from the 1940s well into ’60s, aggressively pushed their shows’ stars and scripts to promote the brands and depict cigarettes as modern, affluent, high-class accessories. It was product placement before such a term existed. Camel sponsored the 1949-56 police drama Man Against Crime (in addition to a nightly news broadcast). The show was forbidden from showing bad guys, and even nervous-looking characters, from smoking. The cool and collected series star, Ralph Bellamy, however, was often seen smoking Camels. The familiar “valentine” logo at the beginning and ending of I Love Lucy wasn’t added until the show went into syndicated reruns. 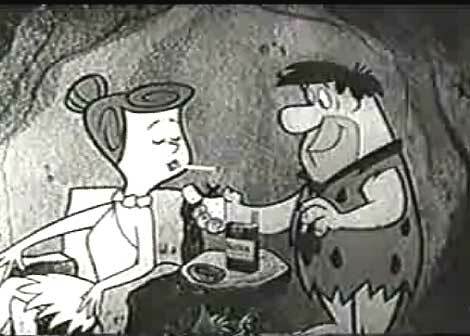 When the show first aired on CBS in the 1950s, it was sponsored by Philip Morris, and began with Lucy and Ricky dancing around a huge pack of cigarettes. The show’s ending had Lucy lighting Ricky’s cigarette, chirping, “You see how easy it is to keep a man happy? 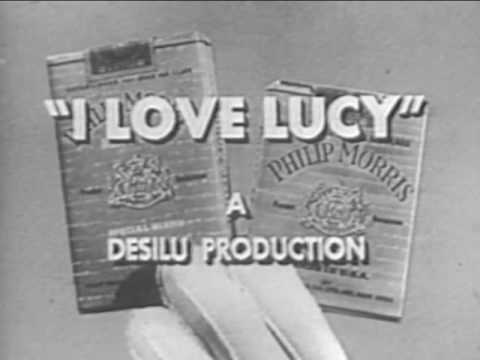 Why not give your husband a carton of Philip Morris cigarettes?” Reportedly, I Love Lucy writers were even forbidden from using the word “lucky” in dialogue because it might remind viewers of Lucky Strike… a brand of rival American Tobacco. And long before Camel’s cartoon mascot Joe Camel was accused of marketing cigarettes to children, animated characters populated tobacco ads, including Willie, the cartoon penguin who smoked Kools; Marlboro’s Harry and Juggernaut Jones; and even, in 1961, Fred Flinstone and Barney Rubble for Winston. The ads worked. In 1949 half of American men smoked cigarettes. By 1955, 59 percent did, despite the landmark 1952 Reader’s Digest article “Cancer by the Carton,” which marked the unofficial end of guilt-free smoking. In 1962, the tide began to turn against the advertising of cigarettes on TV. That year, Surgeon General Luther L Terry announced a review of scientific findings on cigarette smoking. Representatives from medical organizations, plus others from the Food and Drug Administration, the American Medical Association, the Federal Trade Commission, and the Tobacco Institute, were called on to study the findings. In 1964, after the representatives had gone over 7,000 scientific studies, Terry issued the report: Cigarette smokers were up to 20 times more likely to develop cancer than nonsmokers, smoking was a contributor to heart disease, and smoking during pregnancy was known to reduce the weights of newborns. In 1965 Congress required all cigarette packs to carry a health warning label. The government was so adamant about getting out the information about the health effects of cigarettes that in 1967 the FCC required any TV network that aired a cigarette ad to also air an anti-smoking public service announcement. Finally, in 1970, despite pressure from lobbyists, broadcasters, and the tobacco industry, Congress passed the Public Health Cigarette Smoking Act. It completely banned cigarette advertising from television and radio as of midnight, January 2, 1971. The last cigarette commercial, for Virginia Slims, was aired on The Tonight Show at 11:59 p.m., January 1, 1971. The beer ads, however, continue.